At Service Master Restoration by PWF, we know that when disasters happen at your business, they present a whole different set of problems than when they happen at home. Although our homes are our sanctuaries, we need our businesses to make a living. Getting businesses up and running after a disaster is our specialty. We understand that every hour your business is closed while recovering from a disaster is a hour that you are losing money. Commercial buildings are not built like a home. The building materials used in constructing businesses are often coarser and less smooth, so the cleansers and cleaning techniques used to clean them after a disaster are different. Most business have drop ceilings with ceiling tiles or acoustical tiles and sheets or blown insulation, which are susceptible to water damage and are difficult to clean. Wall coverings are often vinyl instead of the traditional painting or wallpaper. Finally the electrical, plumbing, and sprinklers add a layer of complexity in recovering from a disaster. 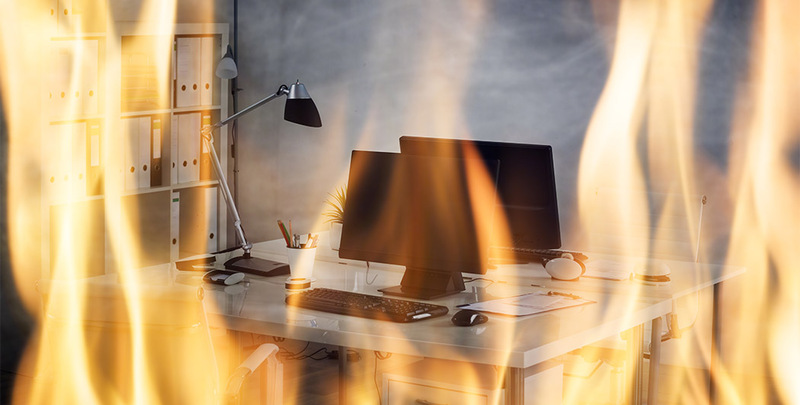 Fire Restoration – in addition to the actual fire, soot and smoke damage, in a commercial building, the fire suppression systems add to the difficulties in restoration and clean up. At Service Master Restoration by PWF our professionals are on call 24 hour a day 7 days a week, and they are trained to understand the complexities of get businesses up and running quickly. Regardless of what type of disaster your business is facing, Service Master Restoration by PWF had the right process to get your business up and running quickly. Assessment – call us 24/7 to get the process started. We know that every hour your business is closed, it is losing money. We will assess the damage, create a plan, and get started immediate. Because we have everything from licensed contractors to skilled cleaners, we can handle the job from beginning to end. Demolition – If your the damage requires any type of demolition, our trained professionals will get the demolition done quickly and efficiently. Not only can we tear it down, we will remove it safely as well. Rebuilding/repairing – whether your building needs major repairs or minor touch ups, Service Master Restoration by PWF is prepared to fix your building’s structural damage. Cleaning – after all is said and done, the last step in getting your business back up and running is cleaning. Proudly Restoring Water, Fire or Mold Damage for our Fellow Business / Commercial / Municipal property owners to Pre-Loss Condition.